How do I set a Creative Commons license for a course? By default, the content you create in your course is considered copyrighted and private. However, if you want to make your course available to others for reuse, you can set a Creative Commons license for your course that specifies how you will let others copy, distribute, or display your work. The benefit of using Creative Commons licenses is that other instructors can use and build and improve upon your own content. This sort of creative collaboration can add value to your curriculum. You can reuse other users' content if it has a Creative Commons license. Licenses range from restrictive use to public domain. If you are not sure what type of license you need, learn more about Creative Commons licensing. While setting a license, you can also use the Help icon to determine which type of Creative Commons license is best for you. You can change your course license at any time. You can set a license for both private and public courses. Learn how to make your course available to users through course visibility options. Note: If you are using Canvas Commons, the license you select for your course is not associated with the content license set for a shared resource. In Course Navigation, click the Settings link. Click the Course Details tab. In the Course Details tab, the License menu is set to Private (Copyrighted). If you want to select a different license and know what license you want to use, click the License menu  and select the license from the menu list. If you need more information about choosing a license, click the Help icon . The Help menu explains the four conditions that comprise Creative Commons licenses. To create a license, click the condition(s) you want to select . The name of the license displays at the bottom of the page . 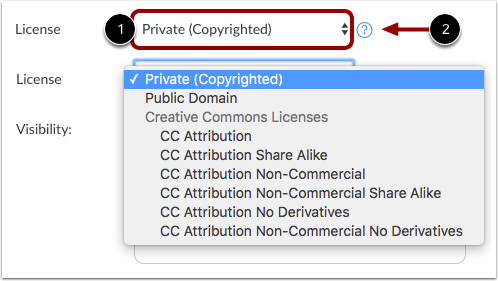 All Creative Commons licenses require attribution, so when others distribute or reuse your work, they must always credit you for your original creation. If you select more than one condition, the Attribution condition will always be selected. The Attribution-ShareAlike license is used by Wikipedia and is recommended for materials that would benefit from incorporating content from Wikipedia and similarly licensed projects. With this license, others can copy, distribute, and use your course content or altered forms of your course content (even for commercial purposes) as long as they credit you and use the same Creative Commons license. When you are finished creating your license, click the Use This License button. View your selected license in the License menu. Click the Update Course Details button. 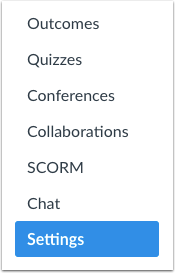 Previous Topic:How do I customize visibility options for course content? Next Topic:How do I include a course in the Public Course Index? Table of Contents > Settings > How do I set a Creative Commons license for a course?